A regular breeding resident and migrant; regular during the winter months throughout most of the state. The Mallard was a common species during the Minnesota Breeding Bird Atlas (MNBBA). Global in distribution and the most widely distributed duck in the Northern Hemisphere, the Mallard can be found from Alaska east across most of Canada and south throughout the United States. The core of the Mallard’s distribution is in the Prairie Pothole Region of the north-central United States and in the southern Canadian Prairie Provinces (Figure 1). A game species, the Mallard is designated a High Continental Priority by the North American Waterfowl Management Plan and assigned a Continental Concern Score of 7/20 by Partners in Flight. A resident to medium-distance migrant; northern populations in Alaska, Canada, and the northern United States winter along the coastal waters of Canada and throughout the United States and northern Mexico. A dabbling duck that feeds on a wide range of aquatic invertebrates, aquatic plants, seeds, small fish, and amphibians; also feeds on waste grain in uplands. Breeding distribution and relative abundance of the Mallard in North America based on the federal Breeding Bird Survey from 2011 to 2015 (Sauer et al. 2017). Although its numbers have waxed and waned over time, the Mallard has always been one of the most common waterfowl species in the state. When Roberts wrote his treatise on Minnesota birds in 1932, he reminisced of earlier times when the Mallard was so abundant “that almost every pot-hole had its breeding pair and the prairie sloughs were full of them.” But by the early 1900s, the absence of harvest regulations had taken its toll not only on the Mallard but on virtually all waterfowl populations. Luckily, the intrepid Mallard survived these early years, and although numbers have never fully rebounded, the species recovered to the point that it was once again a common summer resident throughout the state by the early 1930s. Roberts (1932) reported that among waterfowl only the Blue-winged Teal was more abundant. Confirmed nesting records (nests with eggs) stretched from Lincoln County in the southwest north to Grant County in west-central Minnesota and farther north to Becker, Marshall, and Polk Counties. To the east, confirmed nesting records were reported from Goodhue, Stearns, and Wright Counties. Other reports of breeding activity came from Aitkin, Hennepin, Itasca, Kittson, Lake of the Woods, and Murray Counties and from Itasca State Park. By the 1970s, the Mallard was still second in abundance to the Blue-winged Teal (Green and Janssen 1975), but it surpassed the teal just a few years later when Janssen again updated the species’ status in the state (Janssen 1987). Today, it outnumbers the Blue-winged Teal nearly three to one (Cordts 2015). Green and Janssen (1975) described the Mallard as statewide in distribution but “most numerous in the western regions.” A review of confirmed nesting records since 1970 compiled by Hertzel and Janssen in 1998 documented breeding records from all but 10 of Minnesota’s 87 counties. Its abundance statewide was further confirmed by the Minnesota Biological Survey (Minnesota Department of Natural Resources 2017). During the MNBBA, participants reported 5,229 Mallard records from 56.6% (2,766/4,888) of the surveyed atlas blocks and from 62.5% (1,461/2,337) of the priority blocks. Breeding evidence was gathered in 1,028 (21.0%) of the surveyed blocks (Figures 2 and 3; Table 1). The Mallard was reported from every county in the state and was documented breeding in all but two counties, Fillmore, in southeastern Minnesota, and Yellow Medicine, in southwestern Minnesota. Probable nesting, however, was reported in both counties. The high density of reports in the Brainerd Lakes region and the Twin Cities reflects the high number of MNBBA participants in those areas. An examination of the Mallard’s distribution in priority blocks illustrates its relatively uniform distribution throughout all but the far north-central counties, extreme southeastern and northeastern Minnesota, and the intensively cultivated portions of the Red River valley. The land suitability model for the Mallard emphasizes the importance of the Prairie Parkland Province and the prairie-forest ecotone from east-central Minnesota north through the Hardwood Hills Subsection (Figure 4). Wetlands in urban settings also provide highly suitable breeding habitats. As widely distributed as the Mallard is today, it was largely restricted to western and central North America prior to the 1900s. Its expansion across the eastern United States and Canada was due largely to the release of captive-reared birds for hunting. The Mallard, for example, was “virtually absent” from Ontario prior to the 1950s, but it became “the most widely distributed duck in the province” (Cadman et al. 2007). It is now common in Quebec and the Maritime Provinces as well (Drilling et al. 2002). The only retraction of its breeding range has been in the south, where it was “formerly more numerous and occurred regularly to central Mexico, and rarely to northern Central America” (Drilling et al. 2002). Breeding distribution of the Mallard in Minnesota based on the Breeding Bird Atlas (2009 – 2013). Summary statistics of observations by breeding status category for the Mallard in Minnesota based on all blocks (each 5 km x 5 km) surveyed during the Breeding Bird Atlas (2009-2013). Summary statistics for the Mallard observations by breeding status category for all blocks and priority blocks (each 5 km x 5 km) surveyed during the Minnesota Breeding Bird Atlas (2009-2013). Landcover suitability of the Mallard in Minnesota based on habitat, landscape context, and climate data gathered during the Minnesota Breeding Bird Atlas (2009-2013) using the MaxEnt modeling approach. Open water and adjacent upland cover are the primary habitat requirements of the ubiquitous Mallard (Figure 5). Although such basic needs can be met in a wide range of habitats, from boreal forests to manicured city parks, the prairie wetlands and grasslands of the northern Great Plains provide ideal conditions. When suitable nesting cover is limited, the bird may nest nearly 1.6 km away from open water but more commonly nests within 2 to 300 m (Drilling et al. 2002). Occasionally it will nest on wetlands within dense stands of emergent vegetation. Hayfields, pastures, and cultivated fields also are used. Typical breeding habitat of the Mallard in Minnesota (© Gary T. Seim). Mallard numbers are estimated by the Waterfowl Breeding Population and Habitat Survey, a coordinated effort of the U.S. Fish and Wildlife Service and the Canadian Wildlife Service. The survey focuses on two large areas: the Prairie Pothole Region of the United States and Canada (known as the Traditional Survey Area) and the eastern Canadian provinces and the state of Maine (known as the Eastern Survey Area). Minnesota is not included in either area. The survey conducted in the Traditional Survey Area is considered the benchmark regarding the status of all grassland-nesting waterfowl species like the Mallard. Indeed, in the last 10-year reporting period (2006–2015), the Mallard’s population in the Eastern Survey Area was less than 5% of the population observed in the Traditional Survey Area (U.S. Fish and Wildlife Service; Waterfowl Production and Habitat Survey Database). In 2015 the Mallard’s continental breeding population was estimated at 11.6 million birds, based on numbers counted in the Traditional Survey Area (Zimpfer et al. 2015). This estimate is 51% higher than the long-term average of 7.73 million birds (1955–2014) and 142% higher than the population goal of 8.2 million birds established by the North American Waterfowl Management Plan in 2004 (North American Waterfowl Management 2004). The number counted in the Eastern Survey Area in 2015 was 405,700, yielding an overall population estimate of 12 million birds (Zimpfer et al. 2015). Despite the species’ abundance, Mallard population numbers can fluctuate widely. Strongly influenced by wetland conditions in the Prairie Pothole Region, the population has declined significantly twice since the Waterfowl Breeding and Habitat Survey began in 1955: first during the early 1960s (1962–1966) and second during the 1980s and early 1990s (1981–1995) (Figure 6). Both of these periods were times of notable drought that impacted the availability of wetlands and the quality of upland cover for all waterfowl. Two sets of long-term monitoring data help biologists assess the status of the Mallard in Minnesota. Although designed primarily to monitor songbirds, federal Breeding Bird Survey (BBS) data can provide a reliable index for some common and widely distributed waterfowl species. Statewide in coverage, Minnesota BBS data for the Mallard document a slow, nonsignificant increase of 1.04% per year since 1967; from 2005 to 2015, the rate of increase has slowed somewhat to 0.71% per year (Figure 7). Waterfowl biologists in the state also use a more targeted tool that is similar in design to the federal waterfowl survey. The survey focuses on monitoring waterfowl populations in a region of west-central Minnesota that supports the highest density of lake basins outside of the dense northern forests. Begun in 1968, the survey shows the Mallard’s population steadily increasing until 2005, when numbers declined significantly; since that time, numbers have fluctuated at a level just above the long-term average of approximately 228,000 birds (Figure 8). When survey numbers are adjusted for area coverage and visibility, the 2015 breeding population estimate was 206,000 birds, which was 17% below the most recent 10-year average (Cordts 2015). The general trend observed for Minnesota’s Mallard population is seen for many other nesting waterfowl in the state, excluding the Blue-winged Teal and scaup (Cordts 2015). Because the Mallard occurs statewide, with significant populations throughout the Tallgrass Aspen Parklands and Laurentian Mixed Forest Provinces, regions not surveyed by the state’s Waterfowl Breeding Population Survey, it is not surprising that the two different monitoring tools yield somewhat different results. But in terms of overall abundance, both the Minnesota waterfowl survey and the MNBBA confirm that the Mallard is the most abundant and widely distributed duck species in the state, leading the nearest two competitors, the Blue-winged Teal and the Wood Duck (Table 2). 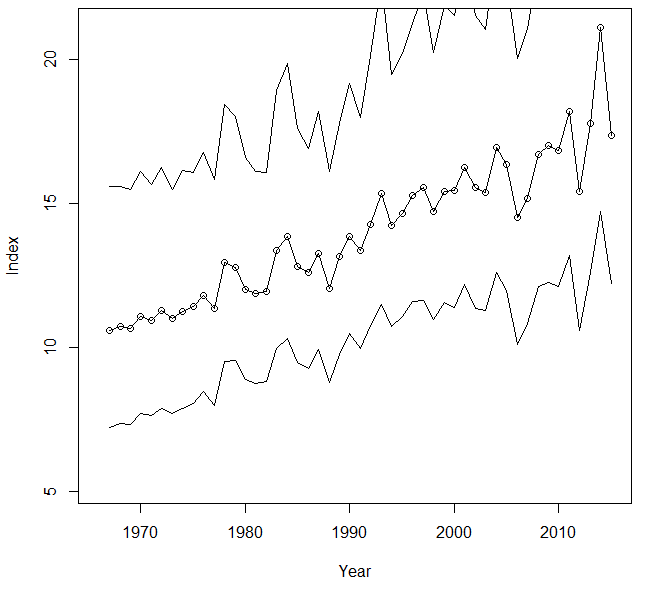 Mallard Population Numbers in the Traditional Survey Area, 1955-2015 (Zimpfer et al. 2015). 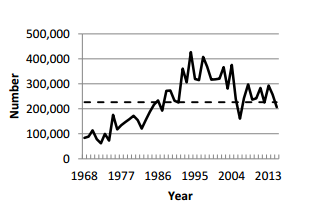 Breeding population trend for the Mallard in Minnesota for 1967–2015 based on the federal Breeding Bird Survey (Sauer et al. 2017). 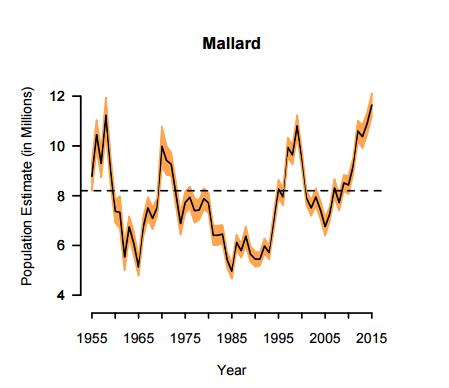 Mallard population estimates (adjusted for visibility bias) and long-term average (dashed line) in Minnesota, 1968-2015 (Cordts 2015). Measures of relative abundance of Minnesota’s most abundant duck species. In light of its large population size and its wide distribution, Partners in Flight (2017) has assigned the Mallard a moderately low Continental Concern Score of 7/20. It is considered a High Conservation Priority, however, by the 2004 North American Waterfowl Management Plan. This is testament to the species’ ranking as the most important waterfowl species in North America, both relative to its overall abundance and its significance as the most important waterfowl species during the fall harvest season. As a game species, the Mallard is clearly king. During the 2015 hunting season, a total of 3.4 million birds were harvested in the United States, comprising 31.2% of the entire duck harvest. In Minnesota, 136,645 birds were harvested, comprising 23.8% of the state harvest. Approximately 75% of the continental Mallard harvest occurs in the United States (Drilling et al. 2002). Although Minnesota’s contribution is less than 10% of the flyway harvest, nearly 50% of the United States harvest occurs in the Mississippi Flyway (Raftovich et al. 2016). Given its importance in the annual harvest, it is easy to understand why the Mallard drives most waterfowl management decisions in North America, from the design and implementation of on-the-ground conservation measures to the framework of annual harvest regulations. Many of these measures were implemented in earnest following the rather disastrous drought of the 1980s and early 1990s, which precipitated a dramatic decline in all duck numbers, particularly for the Mallard. There remains some debate as to whether these conservation actions or the recent increase in precipitation have been responsible for the species’ recovery (Drilling et al. 2002). No doubt both have played a role. In addition to its prominence at the federal level, the Mallard is a focal species for both the Upper Mississippi Valley & Great Lakes Region Joint Venture and the Prairie Pothole Joint Venture, which collectively cover Minnesota. These collaborative interagency initiatives are designed to leverage resources to more effectively implement the goals and objectives of the North American Waterfowl Management Plan at the local landscape level. Ducks Unlimited, a nonprofit organization dedicated to wetland conservation, has also played a major role implementing conservation initiatives that benefit mallards and all wetland dependent species in North America. At the state level, Minnesota has launched two important conservation initiatives that should benefit Mallard populations. The first, the Long Range Duck Recovery Program (Minnesota Department of Natural Resources 2006), has an ambitious goal to restore and protect an additional two million acres of habitat to restore a productive breeding population of one million ducks (all species) by 2056. This represents more than a 100% increase from the population estimate of all ducks in Minnesota in 2014 (489,000). In addition, an aggressive Prairie Conservation Program was launched by numerous conservation organizations and resource agencies, which also established ambitious goals for grassland and wetland protection in the years ahead (Minnesota Prairie Plan Working Group 2011). Unfortunately, an extensive analysis of the response of 588 North American bird species to climate change by the National Audubon Society predicted that by the year 2080, the Mallard could lose 75% of its current breeding habitat, significantly impacting population numbers in the lower 48 states by the end of the century (Langham et al. 2015; National Audubon Society 2016). This analysis led to the classification of the Mallard as a “climate endangered” species. As waterfowl biologists work hard to protect and restore critical habitats, whether or not this widespread and highly adaptable species can overcome such challenges remains to be seen.